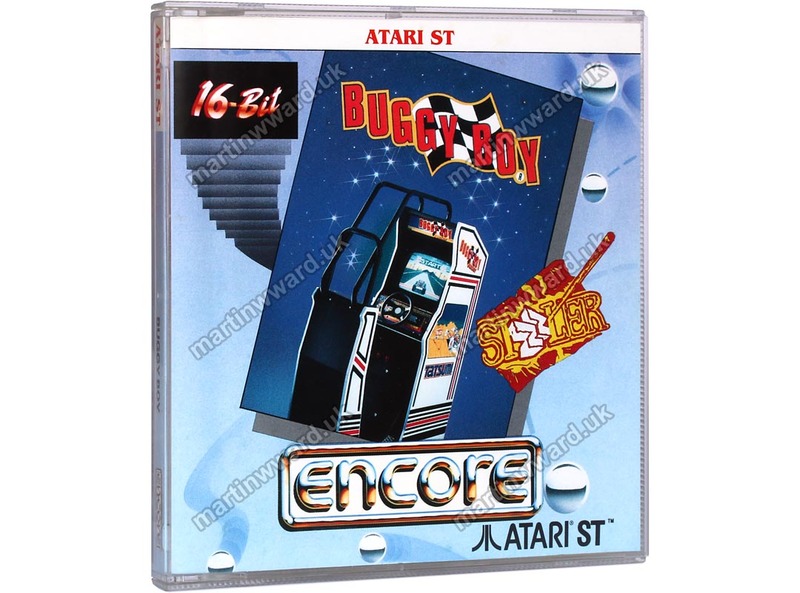 Buggy Boy is a licensed home computer version of the hit arcade game from Taito / Tatsumi. 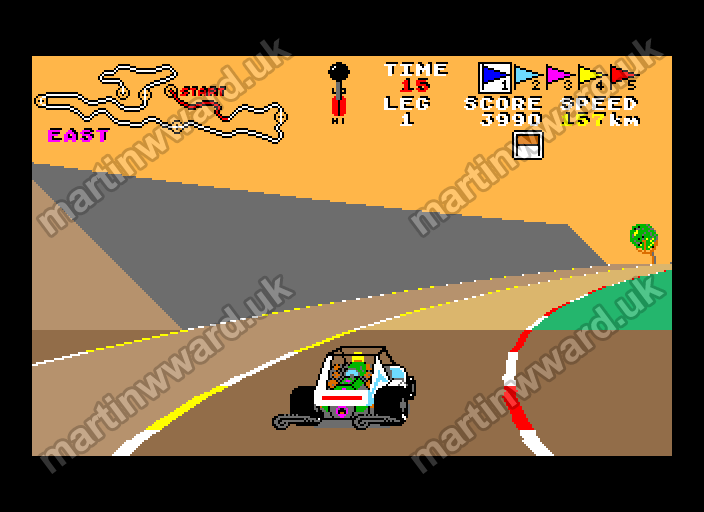 It is a 3D-perspective first person novelty driving simulation, featuring 5 obstacle-filled tracks for the player to navigate in a suped-up dune buggy. Buggy Boy was Martin's first game for the Atari ST.
Use the joystick to select a course and press fire. The race begins. Drive your race-tuned Baja Bug along the race track, passing through gates and collecting flags for points. 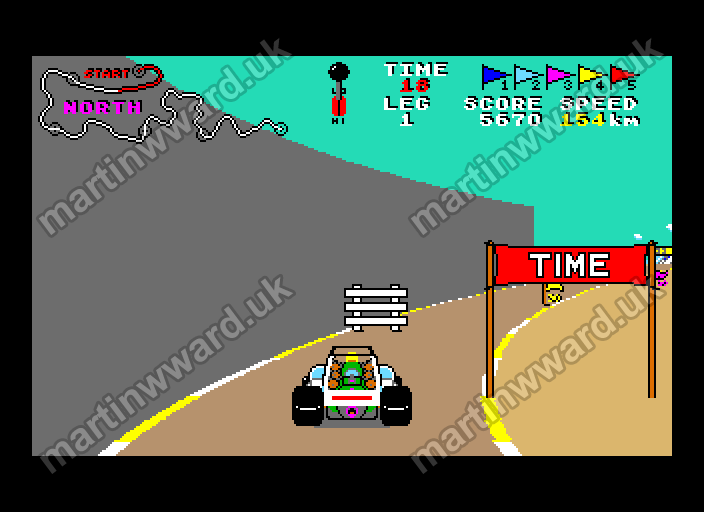 Time gates give you an additional two seconds on the next leg, so drive though them if you can. 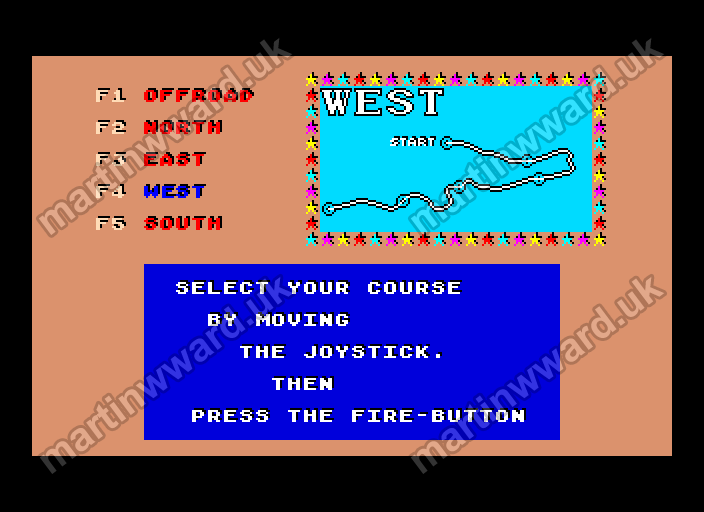 Collecting the flags in the specified order gives you extra points. Avoid hitting the fences, walls, trees, etc. 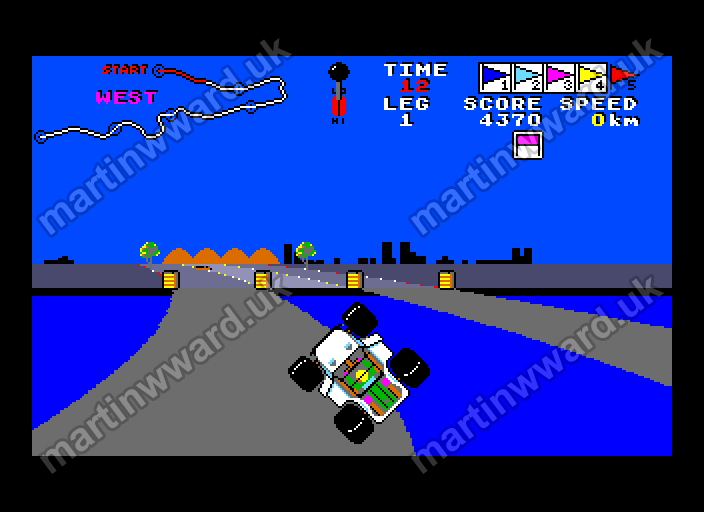 as they flip your buggy over and slow you down. You are competing against the clock so don't waste time, push the pedal flat to the floor. Try jumping obstacles by hitting the logs that lie across the track. 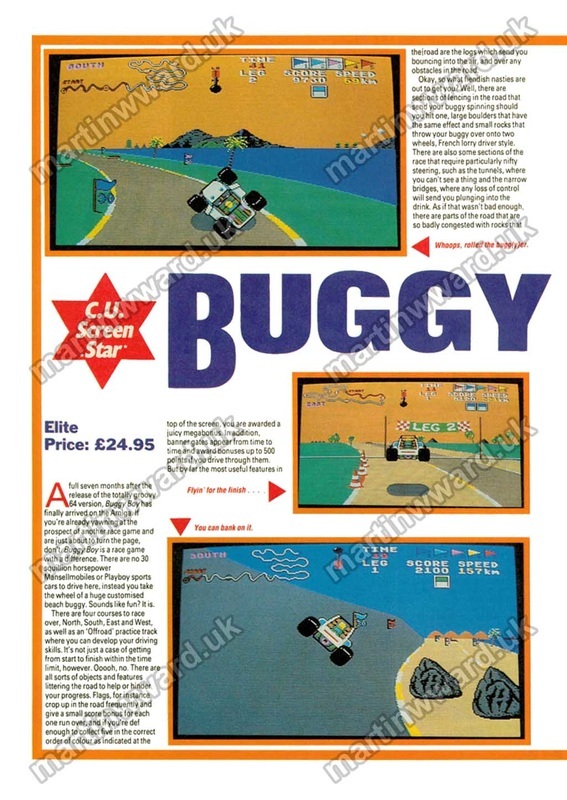 Show off your driving skills by running over mole hills and tree stumps, tipping your car onto two wheels - see how long you can keep your buggy in this trick position. Fasten your seat belt for the ride of your life! 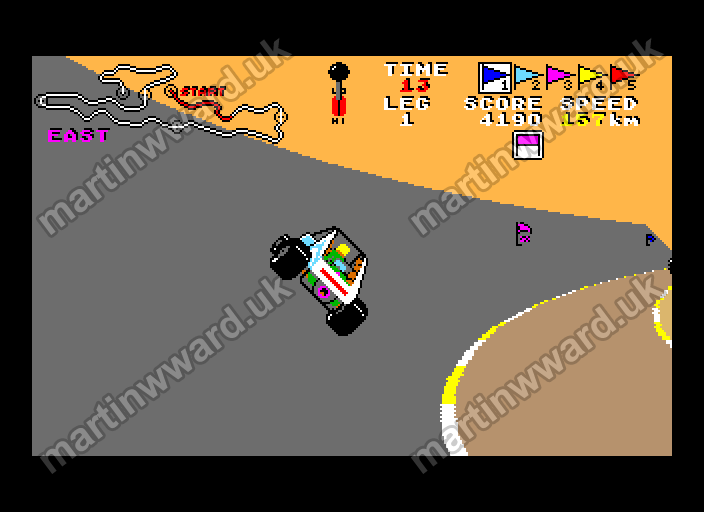 The 5 tracks consist of: OFFROAD - 5 laps of a practice course, and 4 full-length race tracks: NORTH, EAST, WEST and SOUTH - each consisting of 5 legs. The exquisitely-detailed race courses reproduce all of the features of the arcade original. 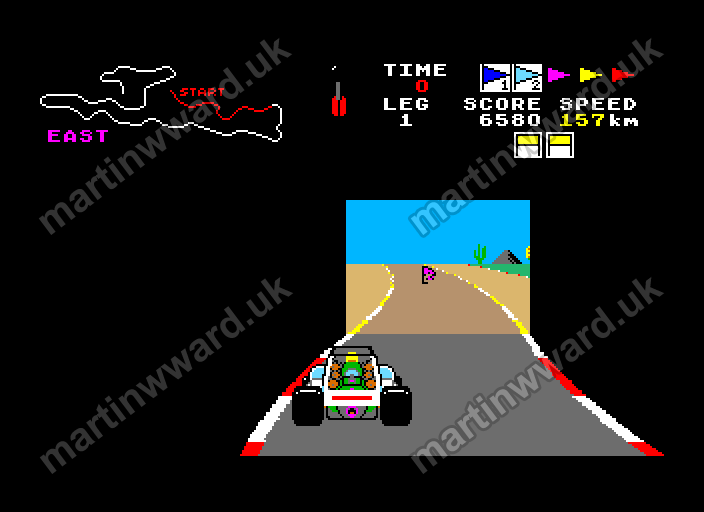 The tracks are lined with trees and lamp posts, and are packed with tunnels, embankments and walls. Rivers are also present, which can be traversed by single- or double-span bridges. All scenery is rendered with true 3D perspective. 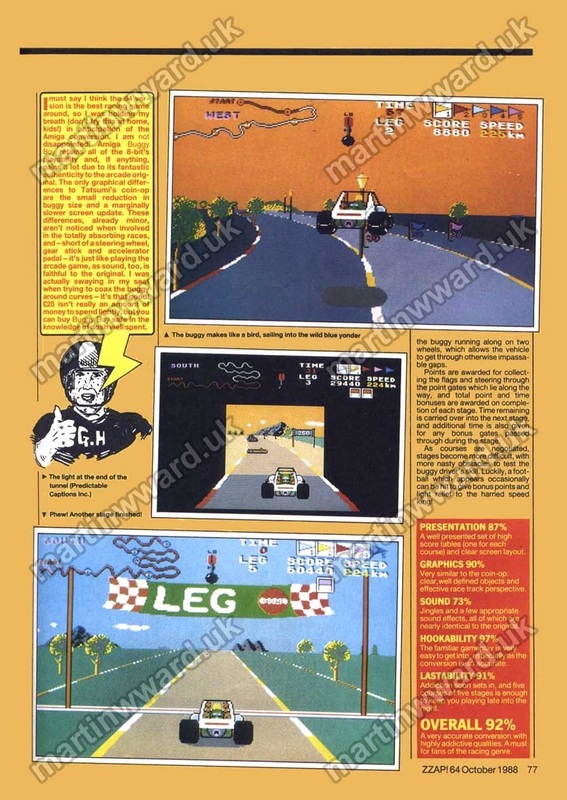 The player must complete each of the 5 legs of a race track within the time allowed, whilst navigating hazards such as road blocks, oil drums, walls and boulders. 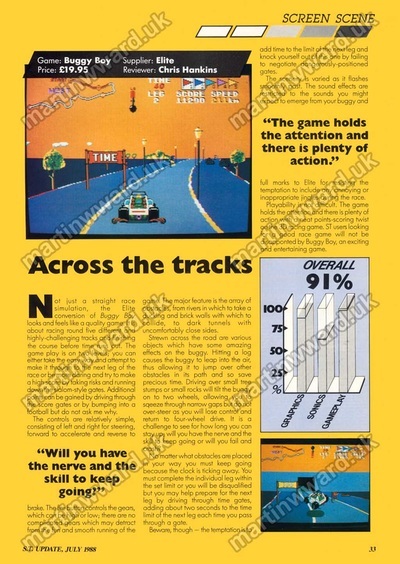 Bonus points are accumulated by picking up coloured flags, and by passing through bonus gates of various skill levels. 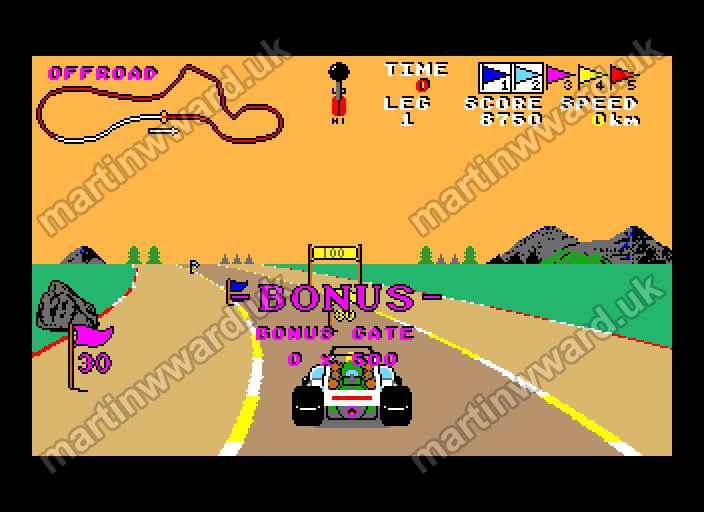 Additionally, the time limit is extended every time the player passes through a bonus TIME gate. 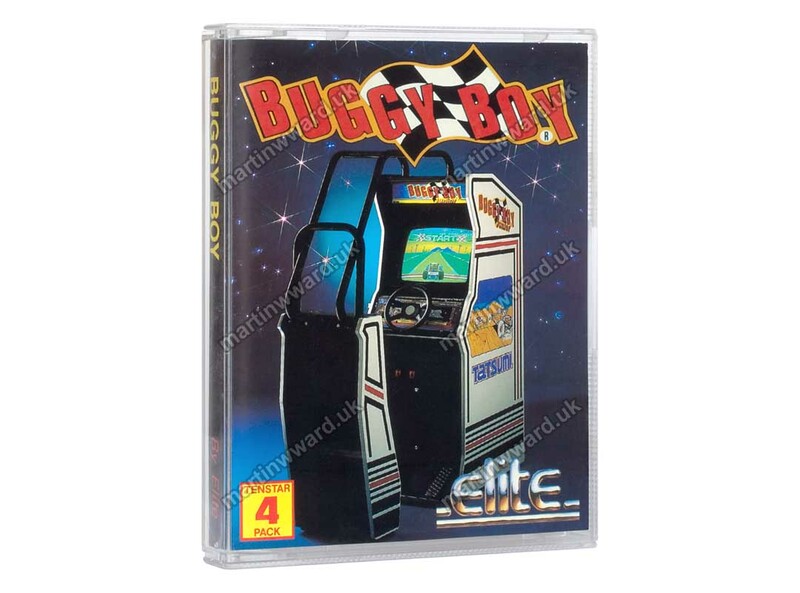 Many of the best bonuses are strategically placed just out of reach, behind road blocks or boulders, but a skilful player is able to reach them by launching their buggy into the air, and over the obstacles, by bouncing off a log, or by driving up an embankment and around the obstacles. 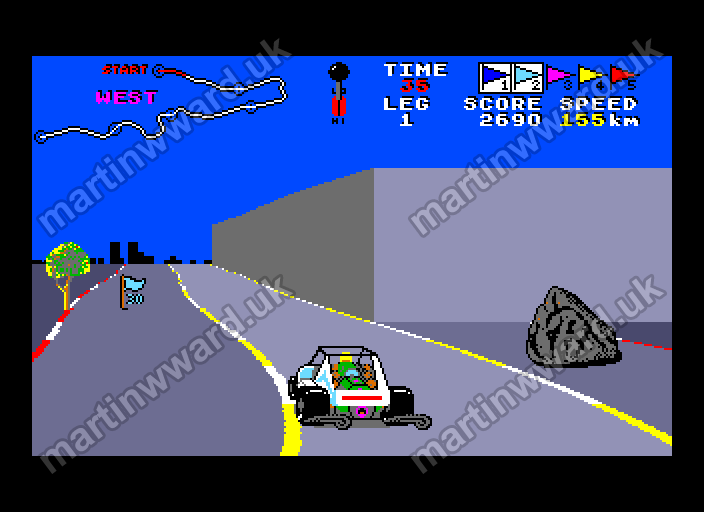 The buggy can also be made to do wheelies by turning sharply while driving over a small rock, enabling the buggy to weave through a narrow gap. There are also several footballs scattered around the courses. 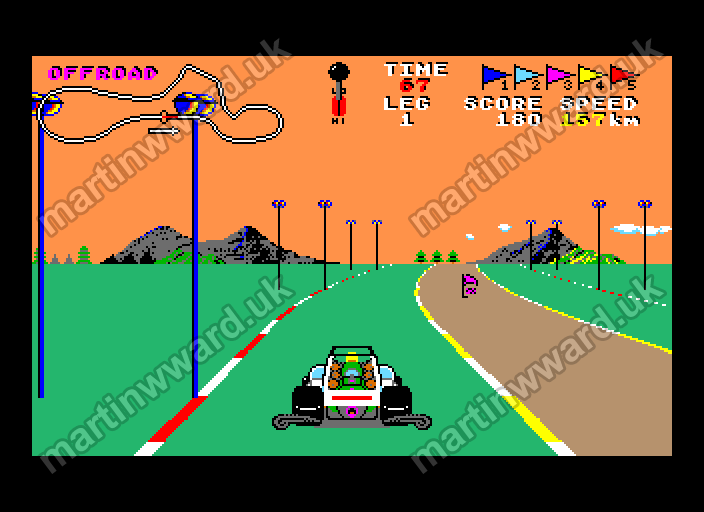 Great fun can be had by driving at these, and watching them launch into the air and disappear into the distance. Caution is needed when crossing rivers. 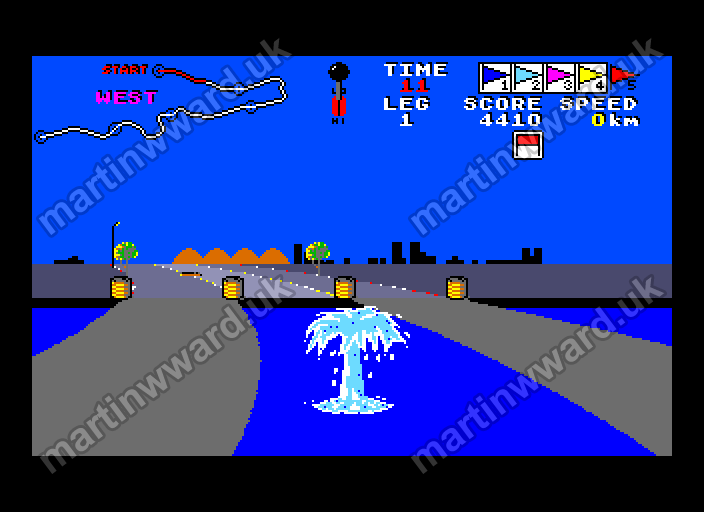 Often the player will clip one of the oil drums at the edge of a bridge, and end up doing a flip and splashing into the water. 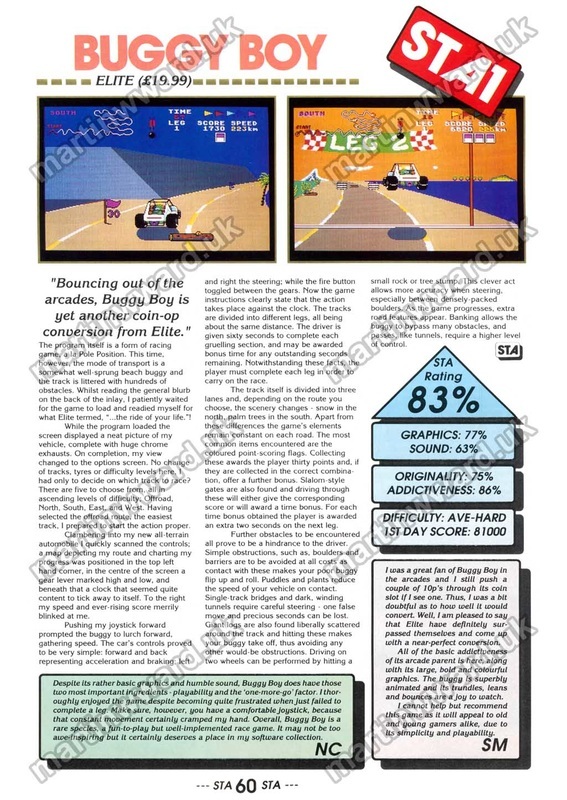 At the end of the game, bonus points are totted up and, if the player's score is high enough, it is entered into the high score table. 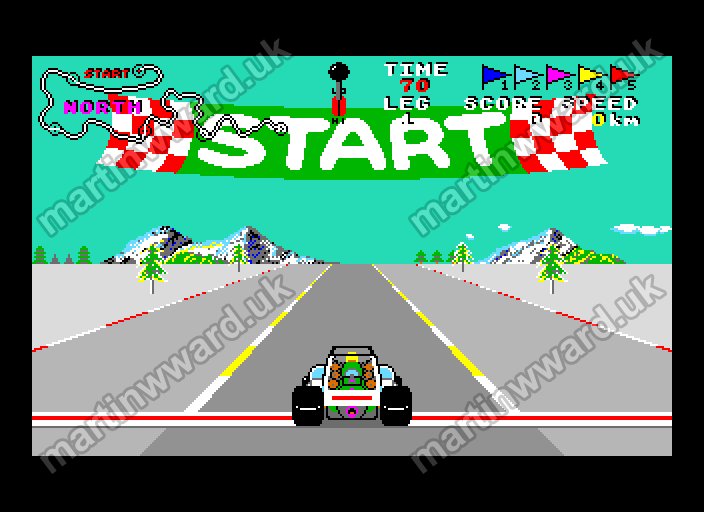 As a freelance games programmer already familiar with the Atari ST and 68000 assembly language, Martin was able to quickly produce and demonstrate, to Elite Systems, a highly optimised 3D perspective road simulation on the Atari ST. After seeing the demo, Martin was promptly awarded the contract to produce Elite's Atari ST version of Buggy Boy. Martin was solely responsible for all of the game's program code, course data and in-game graphics, with the exception of the loading screen. 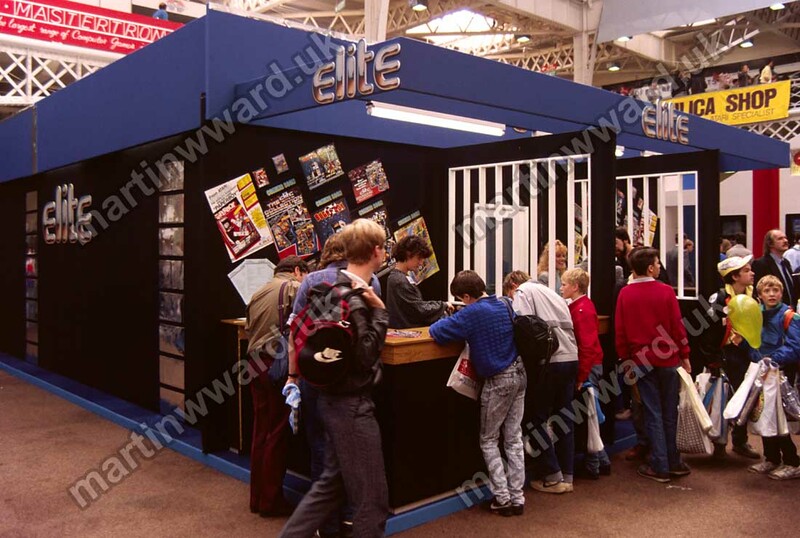 The music and sound effects were supplied via Elite by Jas C. Brooke. 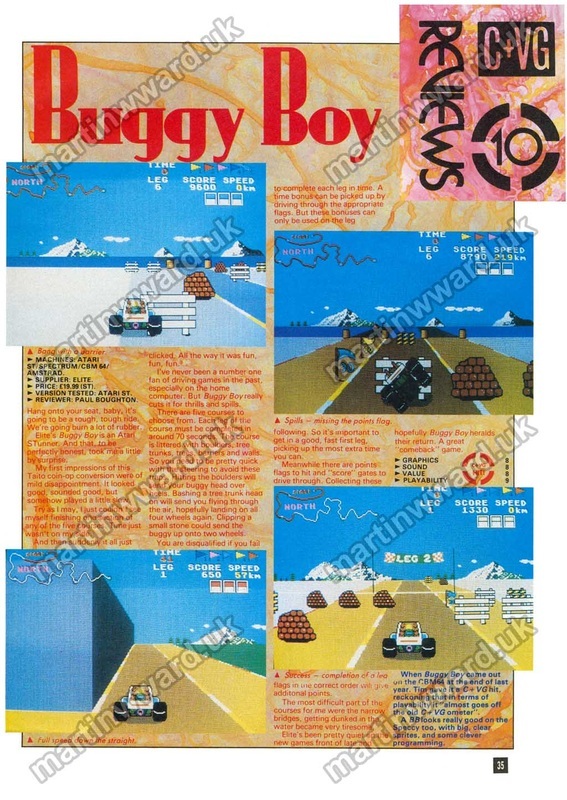 For the Atari ST and Amiga versions of Buggy Boy, Martin made accurate maps of all the original arcade game tracks. 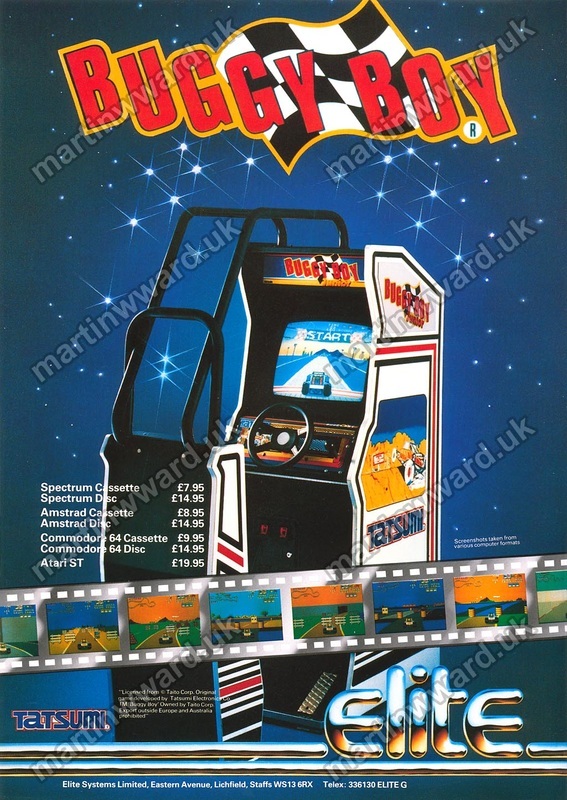 This was done by using a camcorder to record extensive game play of each of the arcade game's tracks. 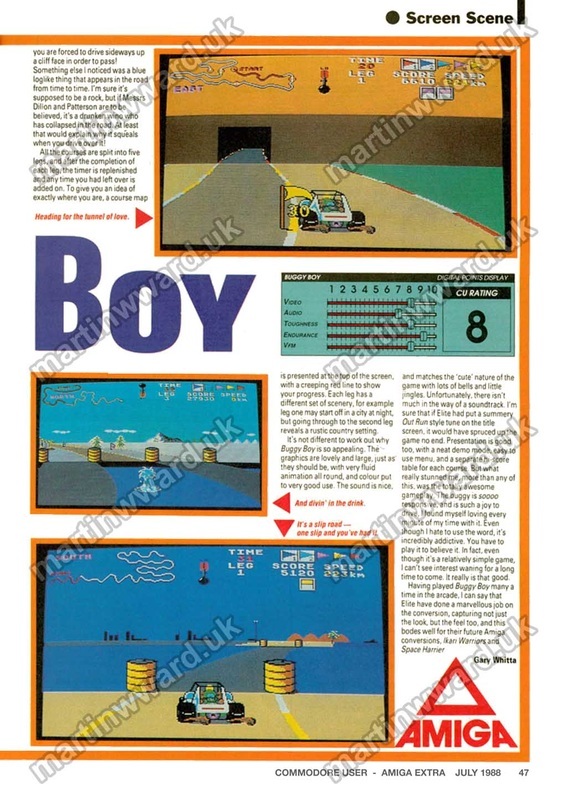 Painstakingly stepping through the video frames, Martin was then able to log all the features, obstacles, scenery, and road colours. 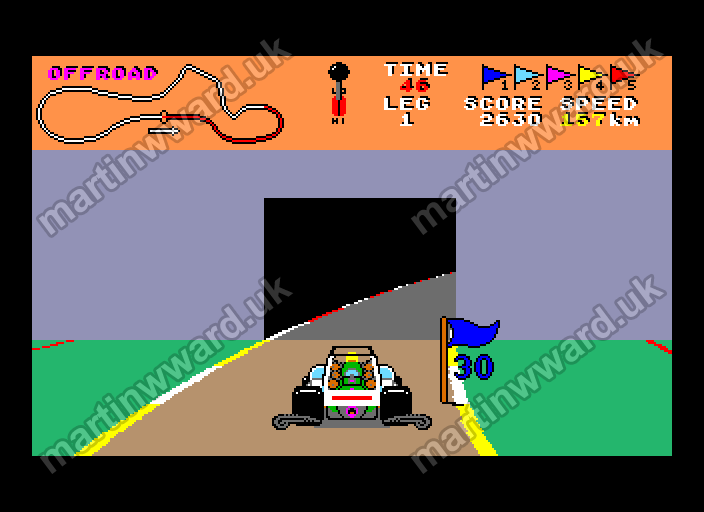 The inclusion of authentic course maps in the Atari ST version of Buggy Boy was a major factor in the game's ability to reproduce the original arcade experience. 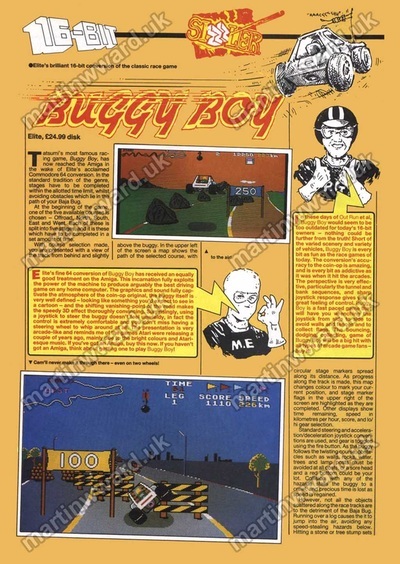 Prior to release, Buggy Boy was previewed and advertised in popular computer games magazines, and promoted at trade shows. 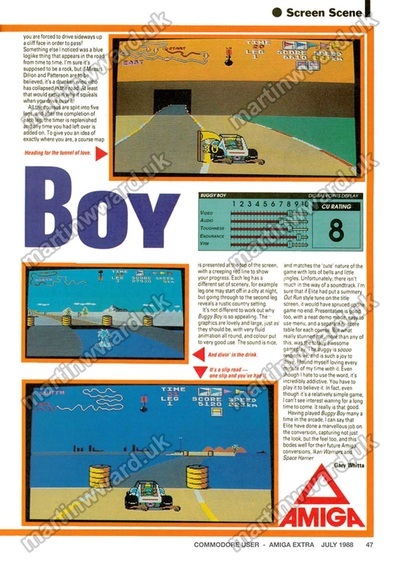 Martin's Atari ST Buggy Boy was launched in spring 1988 and received rave reviews in the computer game press. C+VG : 10 C+VG HIT! 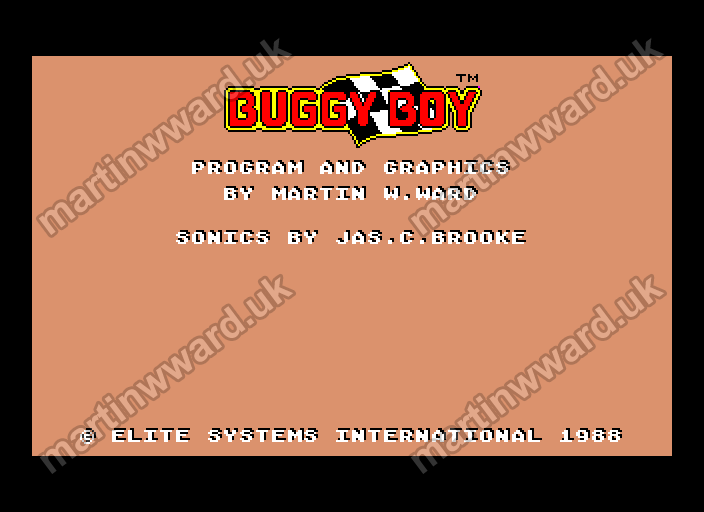 Following Buggy Boy's success, Martin accepted a full-time role developing 16-bit computer games at Elite Systems. The Amiga version of Buggy Boy was produced in house at Elite using Martin's Atari ST game code, graphics, and course data. 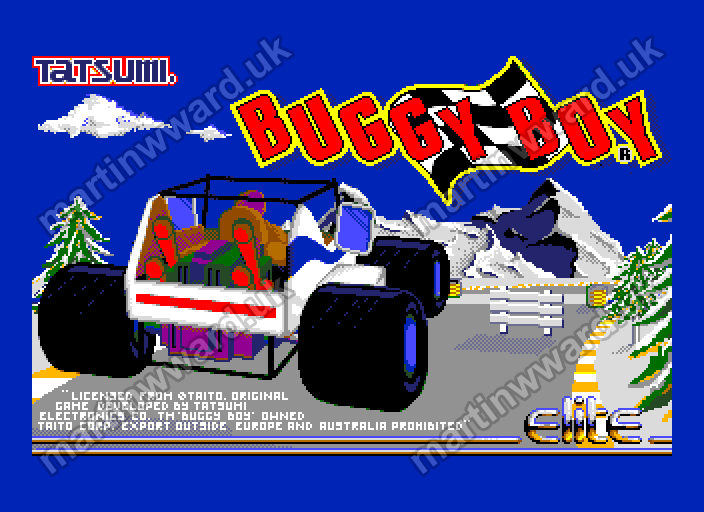 Buggy Boy Amiga is visually identical to the ST version, but runs at a slightly slower frame update rate. 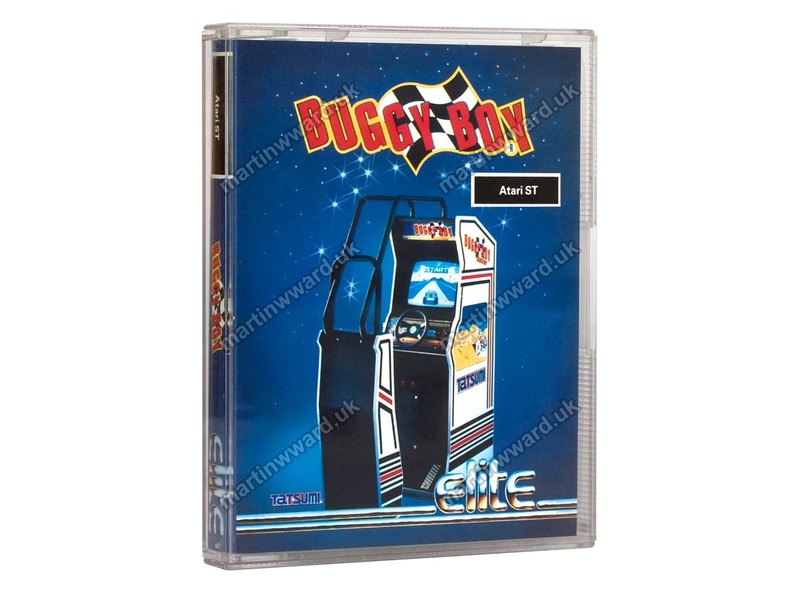 However, it benefits from improved sound effects, owing to the Amiga's superior sound system. 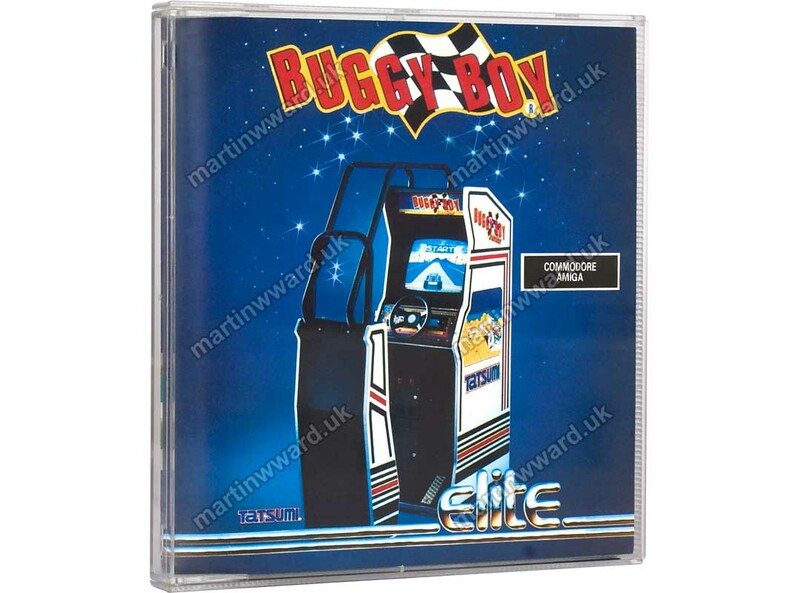 In 1990, the 16-bit versions of Buggy Boy (Atari ST and Amiga) were re-released on Elite's budget Encore label. This involved the production of new packaging.